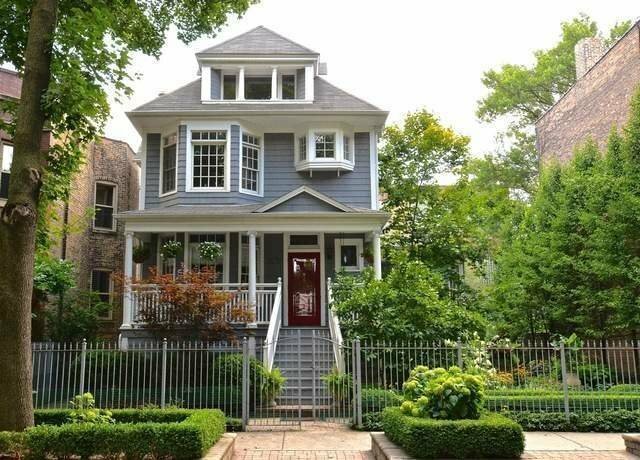 Wonderful opportunity for a 60-foot-wide lot home on a great Lincoln Park block. Flooded with sunlight, this classic home offers recently renovated interiors with an addition that creates a floorplan perfect for today's lifestyle.The main level offers expansive living and entertaining spaces with a formal front sitting rm and a large formal dining room with an adjacent sunroom overlooking the lush side yard and deck. A large kitchen with granite countertops, top end appliances, and built-in banquette overlooks the great room with high ceilings and three walls of windows for tremendous light.Three spacious bedrooms on the second level including the sunny master suite with two walk-in closets and master bath with dual sinks, separate tub/shower, and bedroom level laundry. Two additional bedrooms can be found on the top floor plus access to a terrace.Cozy lower level media/rec room, mudroom, laundry, office/exercise room with wine cellar, and amazing storage. The perfectly landscaped side and back yards make you forget that you are in the city! Oscar Mayer School!